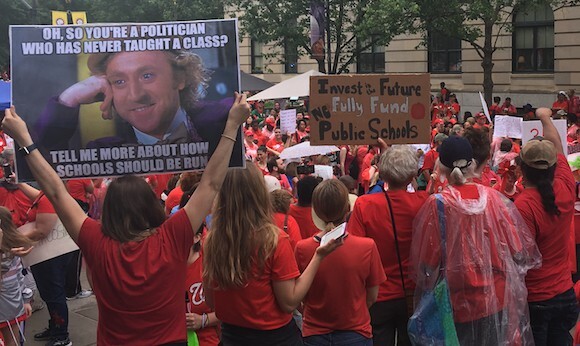 Teachers in North Carolina made a huge statement when they shut down schools in at least 42 districts and thronged the state capital in an all-day march and rally that drew an estimated 20,000 to 30,000 people – way more than the 15,000 the state teachers’ association, that organized the event, promised. While their list of grievances was long and varied – from unmanageable class sizes to inadequate funding to stressed out work schedules – there was one theme that recurred when asked to explain what they hoped to accomplish. The “problem” teachers want to call attention to takes on many forms in their schools, depending on where the teachers work. 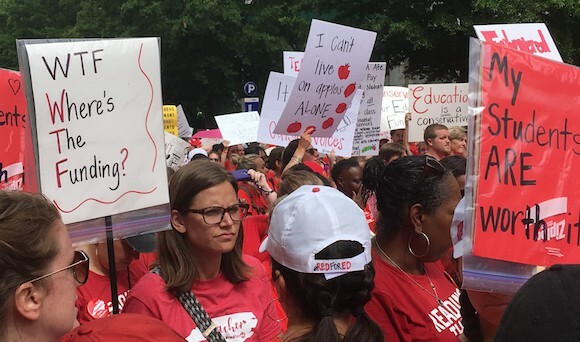 “We’re here today to bring lawmakers’ attention to what’s hurting children in our classrooms,” said Kathleen Van Kuren, a 29-year teacher veteran from Lufkin Road Middle School in Apex, also in Wake County. “While [lawmakers] underfunded resources for our students, cut resource personnel [such as reading assistants and special education teachers], and taken away longevity pay and other salary incentives for teachers, they’ve put more emphasis on charter schools and vouchers,” she said. “There’s no funding for pencils, paper, or art supplies in my classroom,” said Jennifer Miske, a teacher at Rogers-Herr Middle School. “I’m always spending my own money for these things.” Tar Heel teachers typically spend $500 – $1,000 of their own money for classroom supplies their students need. A group of teachers from Bunkum County and Ashville City schools, in the western part of the state, also talked of crumbling textbooks – the history books teach that Bill Clinton is president. State funding for textbooks has been slashed for the past four years. Over-testing of students is also an issue for these teachers, especially in the elementary grades where third-graders are made to take as many as 17 assessments throughout the schoolyear. “The teachers at my school are the hardest working I’ve ever seen, but they’re too stressed out,” said Swansboro Middle School teacher Kim Caister, a veteran who has “taught all over the world.” She described harsh working conditions – including long hours, inadequate support personnel, and outdated, inadequate instructional materials and school facilities – that negatively affect teachers, which in turn, impact students. Her Onslow County colleagues also complained about state lawmakers taking away long-term contracts [commonly called tenure] and the salary supplement teachers get for earning their Masters’ Degree. These incentives were taken away by the state legislature in 2014. The teachers pointed out that losing these incentives has made it more attractive for teachers to seek work in Virginia, which drains their schools of the most capable and qualified teachers. “We need more and better staffing, like nurses, counselors, and other support personnel,” a group of Chatham County teachers said. (Many teachers preferred to speak in solidarity with their colleagues rather than have their names reported.) “We need to have our teacher assistants back.” State funding for teacher assistants was cut in 2008 and has not been fully restored since. “We’re here to open up a dialogue people haven’t been wanting to have,” Molly Wright, told me. 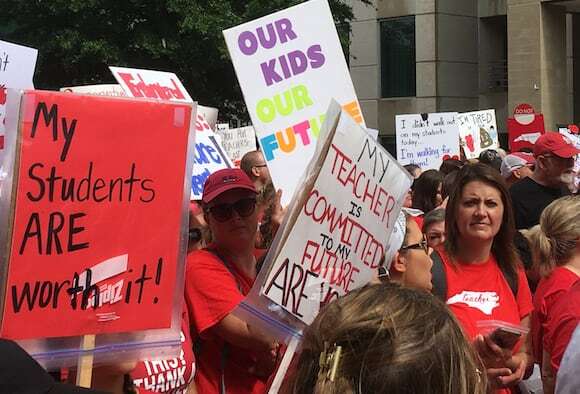 Wright, a teacher at Millbrook High School, also in Wake County, is a second-generation teacher whose mother, a teacher in Forsyth County schools, accompanied her to the march. Wright explained, with a group of teachers around her nodding in approval, that nothing about what teachers were saying at the rally was new. What was new was that teachers had finally decided to go to drastic measures to make themselves heard. Why does it take shutting down thousands of schools and inconveniencing millions of families to get political leaders’ attention? What is this “dialogue people haven’t been wanting to have”? The gap between what goes on in schools and what gets decided in state capitals and Washington, DC has gotten way too wide. For years, it’s been too easy for politicians to ignore teachers because teachers, by the very nature of their work, are discouraged from expressing their anger and sticking up for themselves. The truth is people who’ve been deciding education policy have forgotten we live in a democracy. Teachers in North Carolina, and elsewhere, are reminding us of that. Using the hashtags #Rally4Respect and “ItsPersonal, NC teachers were determined to raise the message that their voices need to be heard. Many of the grievances they brought to the rally have been years in the making, a group of teachers from Gaston, Alamance, and Orange counties told me. But they’ve never believed they’ve had much power to change their circumstances. Until now.